That break from these didn't last as long as I was expecting... Between Friday night and Sunday lunch-time, 5 badges rolled around and so here we are again... Hope you enjoy guys, there's a few crackers in here! A beer that I forgot to write about in the last Catchup was Stone's Go To IPA. It's a session IPA, only clocking in at 4.5% ABV, that's packing a great citrussy hop punch. The body is a little thinner than I'd like, but it does a pretty good job considering it's low ABV. It's 65 IBU's were enough to unlock Hopped Up (Level 25). Thanksgiving isn't celebrated much at all in Australia, although I'm happy to get around the 'Beer-giving' (2015) badge. 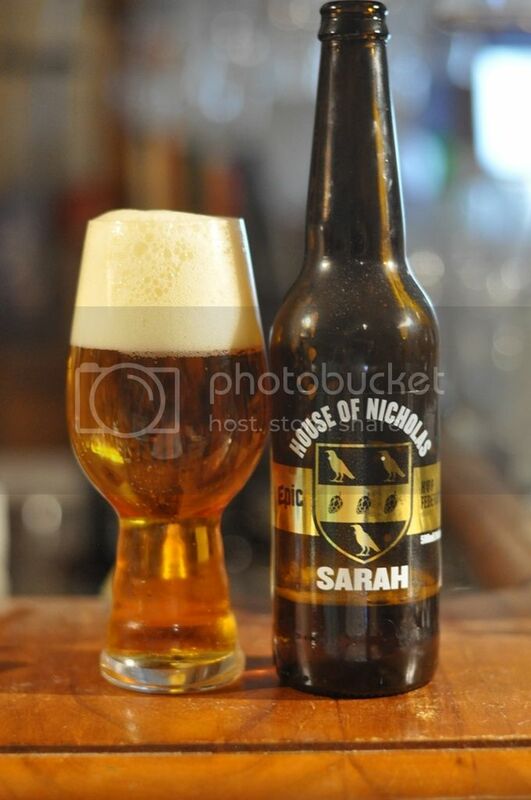 The beer was an English IPA from House of Nicholas, a subsidiary of Epic Brewing, in New Zealand. I've spoken numerous times about my lack of appreciation of English IPA's and this was no exception. It had nice flavours, just not enough of them! I don't understand why you would drink that over a local US-style IPA. A beer I've been hoping would arrive in Australia for months earned Pucker Up (Level 25) and let me down a little bit... The Blood Orange Gose from Anderson Valley is a Blood Orange infused version of this beer, that I reviewed a few months ago. I had high hopes and the Blood Orange flavour was perfect, slightly sweet, citrus that just nailed it. The beer still had the saltiness of the original Gose but was lacking a little in sourness. I'd like to try it a second time, good thing I bought a 4-pack, now that my high expectations have been dampened somewhat. Don't get me wrong, it's still a really nice beer. In my mind, Buxton are becoming one of the premier breweries in the world. Their Pic Tor, a sour passionfruit pale ale, unlocked God Save the Queen (Level 29). Pic Tor, very much like the Gose above, had excellent fruit characteristics with passionfruit the dominant flavour. It's very tart at times and leaves you with a wonderful dry finish. I actually didn't know this was a sour when I bought it, but good it works well as one! Red Eye Rye is just one of the fantastic beers being produced by Dainton Family Brewery. Personally I would classify this beer as a Rye Beer, but in many places it's been called a Red Ale, including Untappd. This is why it's been able to unlock Paint the Town Red (Level 4) for me. I love this beer, there's plenty of rye spiciness cutting through, as well as ample tropical fruit flavours coming from the hops. It's a beer that I've always enjoyed with hearty food. Tulsa Twister is a collaboration between Amager and Prairie Artisinal Ales from Oklahoma in the United States. The name Prairie alone should imply the style; for those of you unsure, they are one of the world's premier Saison brewers. I had this for lunch on a warm Sunday afternoon and it hit the spot. It was brilliantly dry with citrus, grassy and straw all prominent flavours. If you get the opportunity you have to try this beer! The badge was Better Together (Level 7). It was a great weekend of beers. Hope you enjoyed this little wrap up of those that earned Untappd badges. The Red Eye Rye is the best of the locals to keep an eye out for, whilst the Tulsa Twister is definitely worth the coin if you come across it. I've got a pretty cool Summer Beers special coming in the next couple of weeks so keep your eyes peeled. As usual hit me up with any feedback via email, twitter or in the comments below.